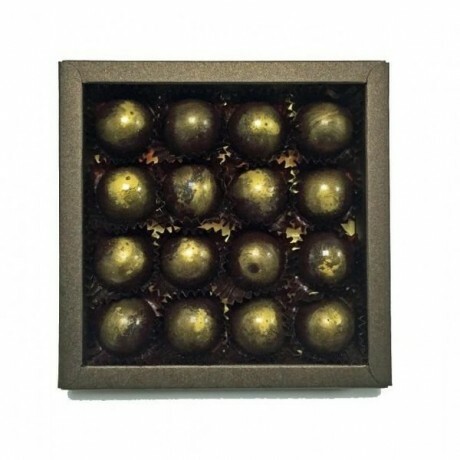 Rum combined with white chocolate, vanilla and a hint of ginger making a smooth ganache centre that is encased in dark chocolate and decorated with gold powder. Simply a fantastic chocolate! Diplomatico Reserva Exclusiva is a fabulous Venezuelan dark golden rum with more than 20 awards to its name. It is distilled from molasses in a copper pot still before being aged for 12 years, resulting in a rum that is rich, sweet and fruity. Lauden Chocolate lovingly handcraft their luxury chocolates in the UK. This box contains 16 chocolates, outer box colour may vary. Shelf life: 6 weeks. Store in a cool, dry place, away from direct light. Delicious chocolate. Received in good time. Very impressed how the chocolates arrived in a mini cool bag! Super job. Excellent and delicious chocolates. Made good Christmas presents too!